We’ve had unexpectedly warm weather for the last few days, with March suddenly feeling more like June. Not quite enough like June to justify the parade of shorts, flip-flops and exposed beer bellies I’ve seen in Manchester every day this week, but still unseasonably summery. Fittingly, then, the book I’ve just finished (I raced through it in a couple of days) is very much the sort of thing I often read on holiday: a highly readable page-turning mystery with strong characters and a distinctive setting, so think Phil Rickman’s Merrily Watkins books, or Arnaldur Indridason’s gloomy Icelandic Erlendur series. 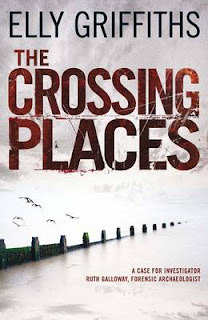 The Crossing Places, the first crime novel by Elly Griffiths, features Ruth Galloway, a forensic archaeologist living in an isolated cottage on the flat, bleak, windblown Norfolk coast, and Harry Nelson, a gruff northern copper. Rather unusually, the story is told through a third person, present tense narrative, which I was convinced would irritate me a great deal – but in fact, I stopped noticing it by page four, so what do I know? The initial set-up is fairly standard: a decade or so after a little girl has disappeared close to Ruth’s marshland cottage, a second child is now missing. When human bones are found close to the site of a previous archaeological dig, Ruth is called in to establish whether the body has been recently buried or has lain preserved in the peat, and subsequently, has a pivotal role in solving the case. I have a hard time believing that Ruth would ever have been allowed access to some of the information or situations in which Nelson includes her, but I can happily overlook that: civilians being inexplicably involved in police murder investigations is a fairly standard device in crime fiction and I accept it here as I have in other books in this genre. The real strength of The Crossing Places is not so much the mystery itself – although there was certainly plenty there to hold my interest too – but its characters and the setting. Ruth, single at 40 and a slightly overweight cat-owner, could easily have descended into cliché, but in fact, she’s a realistic mix of confidence and insecurity and is easily interesting enough to be a worthy protagonist. Nelson, too, has plenty of flaws but Griffiths always makes his motives clear and he, too, is easy to like. There are plenty of supporting players, all of whom are well-observed, believable and sufficiently fleshed-out to play the roles required of them. Saltmarsh, the novel’s fictional location, is almost a character in its own right. Griffiths captures the flat, desolate coastal landscape, more hospitable to wading birds than people and peppered with ancient burial sites, with great skill. It’s easy to believe, as Ruth’s colleague Erik thinks the Iron Age people did, that this landscape, not quite land but not quite sea, has a strange life all of its own. This is really where the archaeological aspect of the novel comes in, although those concerned that the technical details might be a bit much for them have nothing to fear: Griffiths never gets carried away with procedure and what archaeology-speak there is in the book is fascinating. The Crossing Places’ weakness is, for me, that the solution to the mystery stretches plausibility just that little bit too much. As I can’t point out why without revealing what that solution is, I won’t go into detail, but it felt it raised more questions than it answered and I remain entirely sure that it absolutely just could not have happened - although I'd also like to have learned more about why it did, as I felt the killer's motive wasn't quite clear enough. Oh, and I also guessed who the murderer would be, which isn’t ideal – but on the other hand, there were plenty of intriguing red herrings too, and being pretty sure that I already knew whodunnit never once made me want to stop turning the pages, as Ruth’s expectations of, and trust in, those around her were chillingly undermined.